There are minor changes including the wings and updated cameos of the mane 5. Oh, what a riot of colors! This is so out of my style! But it's for the show as a whole, not just for Twilight. I originally made this for "the Return of Harmony," but Hasbro wanted me to add wings. 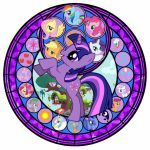 I guess this works for the episode "Twilight's Kingdom: Part 1" or even "Princess Twilight Sparkle" Since both feature the princesses and Discord, Twilight has wings, and the library still exists, but I don't remember if the CMC were in either of them much. Oh well. 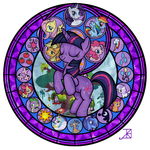 Characters and symbols are from My Little Pony: Friendship is Magic, copyright Hasbro. I do believe I've gotten better. You really did better with this one, great job. I have the messenger bag from WeLoveFine with this design, i adore it! ^__^ great work! As I said in another post... this reminds me too much of the KH islands from the dreamscape, where Sora gets his Key... I really love the effect and I love all the detail you put into it. You're best work so far. "...but Hasbro wanted me to add wings"
Wai-Whoa-whoa-whoa-whoa-Whoa! Wait! ...You're getting feedback from HASBRO THEMSELVES now!? They are actually recognizing your skill and art!? Should we be cheerful or cautious? 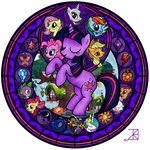 Looks beautiful, but Spike and Discord really need to switch places. no cadence? no shining armor?